Anything, everything, an internet of things! BT has begun trialling a new technology from tech company Neul on machine-to-machine (M2M) communications using 'white space' technology. These tests involve sending traffic information to and from moving vehicles via gaps – or 'white spaces' – in the frequencies bands used for digital TV broadcasting. White space networking could enable up to 50 billion devices to be connected wirelessly to the internet by 2020, say BT. 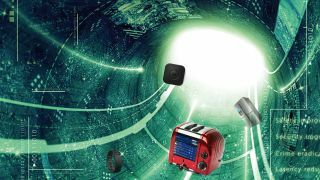 "The internet of things market has huge potential, but existing short-range and cellular networking technologies are unable to meet the requirements of many applications we see," Mark Harrop, director of mobile strategy at BT, said. "A networking technology that can provide deep indoor coverage, last for many years from a single battery, is simple to use, and comes at the right price point is essential for realizing the true potential of the internet of things." BT has been conducting these trials since late last year, but now they are using the new NeulNET system. The NeulNET system provides two-way, wide area M2M networking that Neul claims "far outreaches today's GPRS, 3G, CDMA and LTE WAN solutions". The NeulNET system uses an antenna-equipped base station that can provide wireless coverage in a radius of up to five kilometers, along with terminal modules that can run for up to 15 years on two AA batteries and can communicate from deep within buildings or underground. The system, delivered by Neul as a cloud-based managed communication service, can operate in either licensed or unlicensed spectrum, and across a wide range of frequency bands. Neul adds that it expects to announce further deployments of its NeulNET technology throughout 2014. It says the system could enable smart-city applications ranging from waste-disposal bins that "ask to be emptied" to green-belt areas and farms that are monitored and watered efficiently.